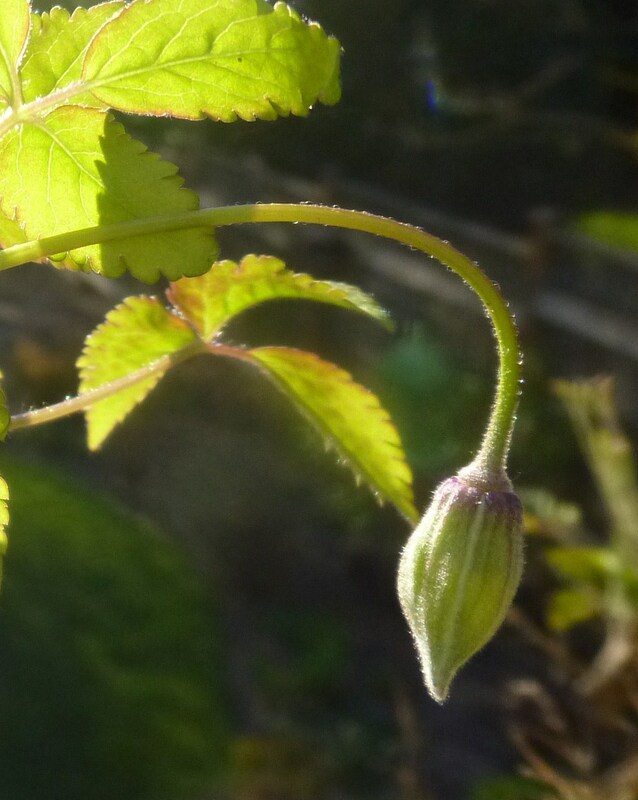 My First Ever Flower Bud on a Seedling! On one of Seattle’s recent lovely warm spring days I decided to take a peak at my clematis seedlings to see how they faired over the winter. Although I keep all my seedlings outside year round, I protect them a bit from Seattle’s winter rains by tucking them under Adirondack chairs and glass tables. When I pulled all the trays out into the open the other day, I was thrilled see my very first flower bud nodding in the sunshine! And such a lovely thing it is, too, don’t you think? My clematarian friends first encouraged me to plant clematis seeds in 2010, and I’ve planted more every year since. Though many have sprouted, none had budded yet—until now. This particular plant, which I personally caused to come into being, is from seed sent to me in 2010 by a friend in Sweden. The mother clematis (mysteriously named Clematis koreana var fragrans H38) is a spring-blooming plant with fragrant nodding bells (click here to see photos). Though not widely grown, H38 is important because it has been used in seed crossings to develop several fragrant clematis. Hmmm, I wonder which clematis I should cross mine with to try to achieve a brand new fragrant clematis hybrid. Thanks, Katie! I think so, too.